The pigeon-lover (whose name I’m going to withhold for reasons that will soon become clear) met me at the corner carrying a baby pigeon, still bearing the tell-tale yellow hairs of his infancy. She said she saved the orphaned bird after the weekend massacre. And she also claimed to know who slaughtered these defenseless birds. “It’s that guy, right over there!” she said, pointing at him. All I saw was a man sweeping debris in front of his house. But, wait a second, that’s not debris — it’s birdseed! 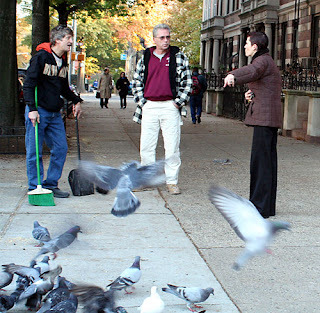 The man denied poisoning the pigeons, by the way, but he didn’t deny sweeping up all the birdseed that the pigeon-lover had left. Anyone else think that she put out the poison seed so she can get herself noticed? She needs to be removed from the street before she kills again.